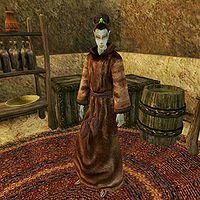 Rarvela Teran is a Dunmer pawnbroker found at the No Name Club in the southeastern corner Vivec's Hlaalu Canton plaza. She has a few items for sale, but given her position in the Camonna Tong, you'll probably find them cheaper elsewhere. This page was last modified on 5 March 2018, at 01:00.